A majority of this issue is set up for future stories as well as focusing on the character development of Doom in the past vs our current Doom on his rocky road to redemption. It looks like Victor is in for quite a few speed bumps along the way. 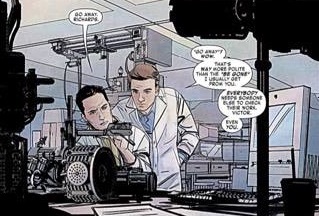 The issue opens up with early flashbacks to Victor’s college years and his rivalry with Reed Richards. This shows the dynamic between the two and the early force that drove him to become a villain. Now things have changed Reed is the reason for his second chance at redemption. His main goal is to take down and apprehend villains that Victor has worked with in the past, in particular former members of the inteligencia. Victor’s current target is the Wizard. As usual Victor doesn’t have trouble taking him down. However Victor isn’t able to escape without attracting attention. 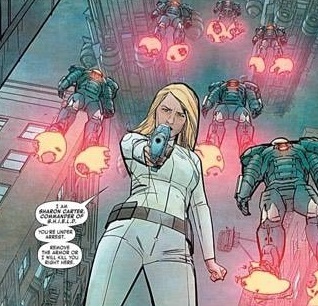 SHIELD and commander Sharon Carter try to intervene. I really enjoyed that this scene is because of how it showed that Victor actually respects Maria Hill compared to Sharon Carter. That makes a lot of sense for Victor since Maria is much more willing to make the harder more grey area decisions whereas Sharon seems more like a by the book kind of leader. One other thing I enjoyed was everyone’s reaction to Victor. At first Sharon assumes that he’s just up to his old tricks, but instead he just talks to her and leaves without even trying to attack any of her agents. That leaves her to wonder is this the same Victor Von Doom? Sharon isn’t the only one wondering this question. Later we are shown Doom’s mother, but she is not alone. She is accompanied by someone who looks a lot like Reed Richards. Hold on a second, before all the Fantastic Four fans get too excited that Reed is back in the main universe let me clear this up. The Reed shown here is actually The Maker, an evil version of Reed originally from the ultimate universe. It seems like Reed and Victor’s mother have plans for him and I can’t wait to see what they are. 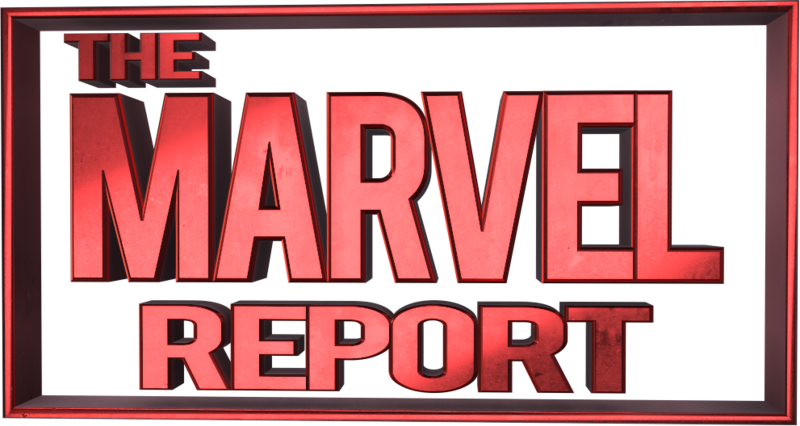 Lastly our two iron clad heroes will finally meet as Riri Williams goes to investigate the recent reports of numerous Iron Man sightings. 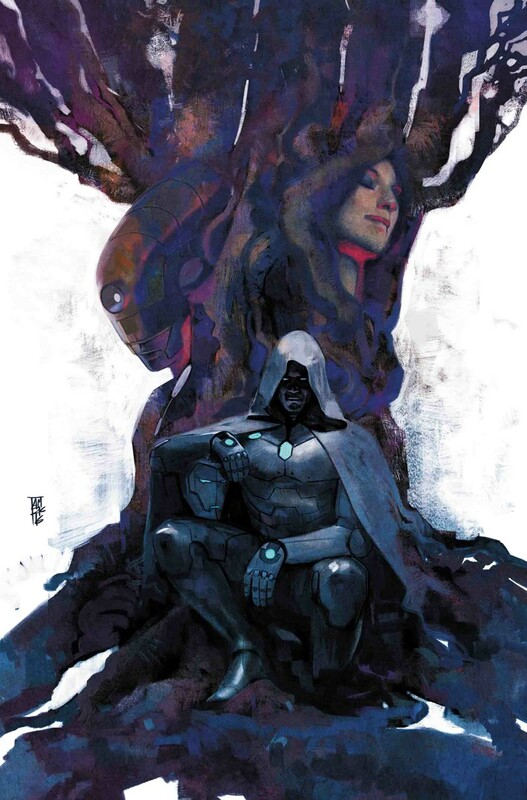 Infamous Iron Man remains as one of the most consistent books in terms of art. I’ve said it before, but I’ll keep repeating it until it stops being true the art matches the tone of Victor’s character perfectly. It seems elegant and refined, but the colors also show the bits of darkness and moral grey that still exist within Victor. The action scenes were a lot of fun. Victor’s armor looks cooler every time I see it. Some of my favorite panels are just the ones of him flying. Another thing that I really liked is whenever Maleev chooses to cut from a close up of Victor’s face to one of his helmet. That is a clever way of showcasing emotion without forcing Victor to lower his face plate. Once again the art is fantastic. Overall I did enjoy this issue but I did have a few problems. As with any good Bendis story the pacing can be very slow at times however, my biggest issue with Infamous Iron Man #6 was that unlike the previous issues I felt that this lacked focus. 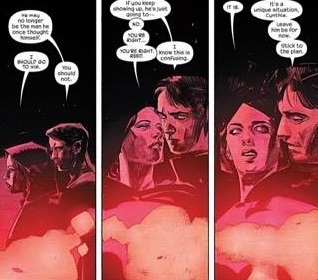 Instead of having a central focus that continues to build Victor’s character this issue just seemed like a bunch of different set ups thrown out at once, especially near the end. I will say that I am definitely interested in seeing Victor’s interaction with Riri since the flashback in the beginning of the issue showed us that Victor doesn’t really handle interacting with fellow prodigies well. 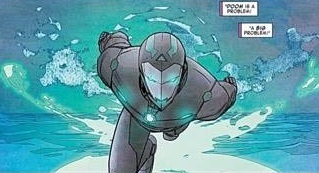 If you’re a Doctor Doom fan then I recommend you pick up Infamous Iron Man #6, but if you’re just curious about it I think it will read much better in trade.